Justice League releases to Blu-ray Disc, 4k Blu-ray, and DVD on Tuesday, March 13. And along with the common Blu-ray editions, Best Buy, Target and Walmart all have their own exclusive retailer editions. 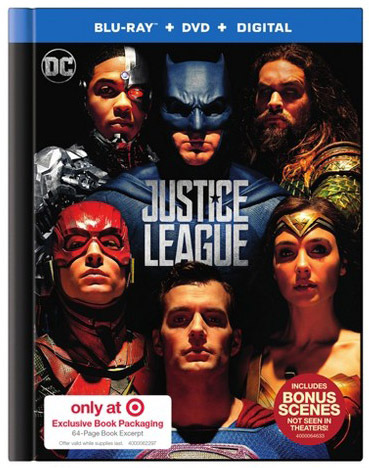 On Blu-ray and 4k Blu-ray Justice League is presented in 1.85:1 (16×9) widescreen aspect ratio in either 1080p or 2160p resolution depending on the disc. The Ultra HD Blu-ray edition also features HDR (High Dynamic Range) color with Dolby Vision. Both Blu-ray editions also offer a Dolby Atmos soundtrack backed up by DTS-HD Master Audio in English and Dolby 5.1 soundtracks in English, French and Spanish for systems that don’t support Atmos. 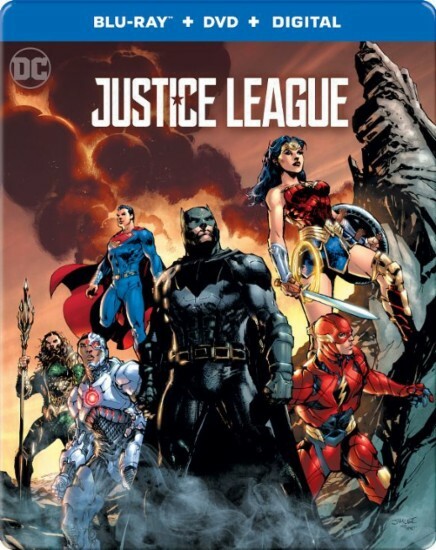 The Blu-ray editions of Justice League include digital copies via Movies Anywhere and the extras “Heart of Justice,” “Technology of the Justice League,” “Justice League: The New Heroes,” “Suit Up: The Look of the League,” and more. 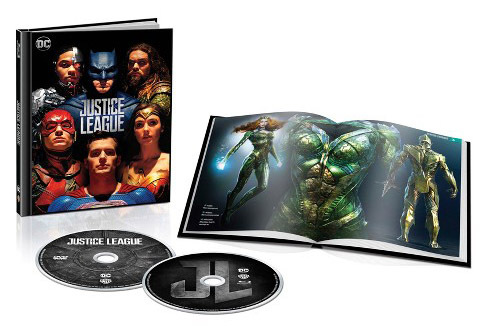 Best Buy’s exclusive editions of Justice League feature their usual special SteelBook case with custom artwork that one can argue is alone worth paying more than the common edition. Best Buy’s Blu-ray ($29.99) and Ultra HD Blu-ray ($34.99) both come with a second disc copy on eiither DVD or Blu-ray and a Digital Copy. 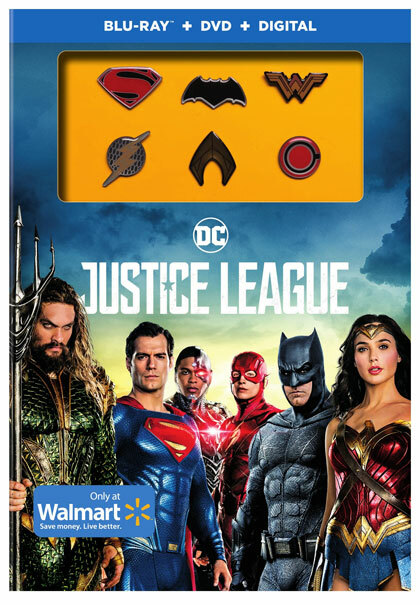 Target’s exclusive “Book Packaging” edition of Justice League (pictured both open and closed above) sells for $27.99 and comes with a DVD and Digital Copy. We have not seen an exclusive 4k Blu-ray yet from Target. Walmart has their exclusive Blu-ray edition priced $27.96, and the Ultra HD Blu-ray edition priced $29.96. 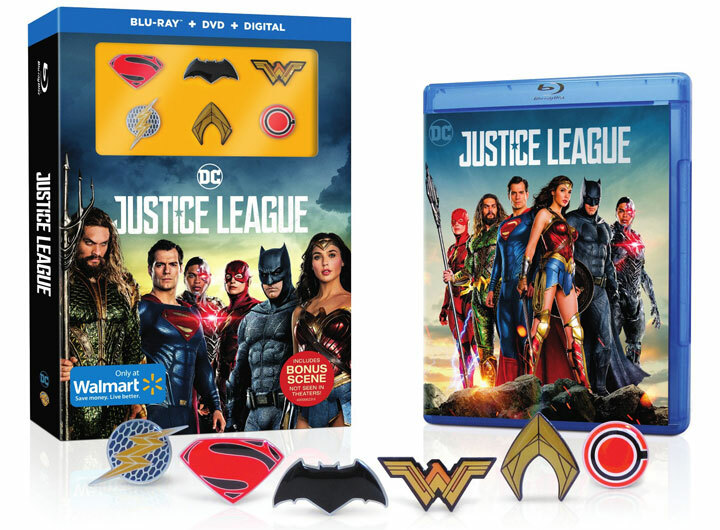 The Blu-ray edition includes the DC superhero emblems pictured above in a box that’s slightly different from the Blu-ray disc case itself. It’s curious though the packaging for their exclusive 4k Blu-ray ediition on their website looks the same as the standard Blu-ray edition.